◆ Head Strap: Allow you to attach and adjuste your Gopro camera on your head. Convenient and free your hands. ◆ 360-degree Rotation Wrist with screw: Allow you to attach and adjust your camera to your wrist. ◆ Anti-fog inserts: Insert a few of these into the camera housing, it will not fog up. Put it into oven to heat a few seconds, then it can be use again. ◆ Self stick + Tripod Mount Adapter: Allow you to use the 180 degree position self stick to the height or distance that you can not reach. Small, lightweight and portable, easy to store. ◆ Please use Floating Handle in water sports to avoid losing your camera. ◆ The waterproof case and Gopro NOT included !!! If you need the instructions, please contact our customer service by email. We promise to send it to you as soon as possible.【More different combinations】- Head Strap with Long Screw. Suction cup mount with Black Buckle Basic Strap Mount. 360 Rotation Wrist Strap with 3-way Pivot Arm. Different combinations allow you to create different exciting moments . 【Bike Handlebar + Pole Mount】- This combination kit will allow you to fix the action camera on the bicycle handle bar. Perfect for extreme movement for bicycle. 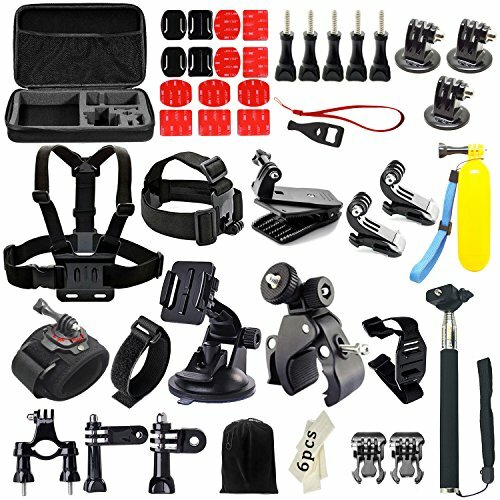 【Floating Hand Grip + Long Screw】- This combination will ensure your camera safety when in water sports. Easy to be found. Feel particularly comfortable when you holding it. 【Vented Helmet Strap + J-Hook Buckle Mount】- This set will allow you to fix camera on your helmet. Easy to install or capture immersive video and photo. 【Chest Harness + Black Buckle Basic Strap Mount】- This set will allow you to put GoPro Hero on your chest. Compact size, stable and solid. Fully-adjustable design.